There are some recipes so simple that the experts miss the point. You know how simplicity is always misunderstood, people want to add more value to the things they do to create something good and miss the greatness in the simpler things. In the case of alu ke gutke recipe something similar happened. I had posted pictures of alu ke gutke on instagram recently and had been getting requests for the recipe after that. I intended to write the recipe here but since the alu ke gutke is quite simple I gave a quick recipe to one of my friends. She went on to google the recipe to make it, not realizing someone can screw up such a simple almost one and a half step recipe, she forwarded me the link and I was aghast to find a recipe with all the spice powders and hing-jeera and what not. Alu ke gutke needs to be shared here I decided. So here is the unpretentious recipe of alu ke gutke that is the best representative of the frugal ife in mountains. 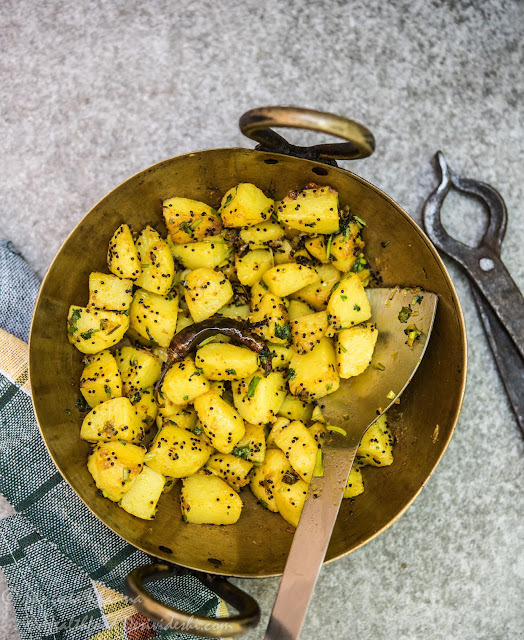 Alu ke gutke is made in every pahadi home in Garhwal and Kumaon region, potato being the main crop and not much variety of vegetables available to them at higher altitudes. Writing this, I am reminded of a small trek we did in the hills of Sattal few years ago, we just followed a track that started with a faded signboard with a name of some nondescript temple and after an arduous one hour trek reached a temple surrounded with a well tended garden. We met a baba (a saint) and got to know he is from Banaras who went there several decades ago and has settled down in that temple, we were offered a plate of this alu ke gutke with hot ginger chai, free of cost. One of the most satiating meals I must say. Alu ke gutke is available in the hills at almost every chai shop, served with a cup of hot chai if you wish and often topped with mooli ka raita. A very unusual combination but works wonderfully when trekking or even driving in the hills. The frugality of alu ke gutke is such that it uses all dry ingredients, just 6 ingredients including salt, apart from the occasional chopped dhaniya patta when it is in season. It tastes best with the pahadi potatoes, cook it in the plains only with the new potatoes or forget about alu ke gutke, it is not alu ke gutke if the alu is not right. The second important, non-replaceable ingredient is jakhia that imparts a subtle flavour and a delectable crunch that stays even if the alu ka gutka is cooked hours before you eat. Jakhia (Cleome viscosa) is a herb that grows in the foothills of Himalayas as well as in the tropics throughout the world, the leaves are used as a vegetable and all parts of this plant as medicinal ingredients, the use of the seeds in a tadka like this is seen only in Uttarakhand. 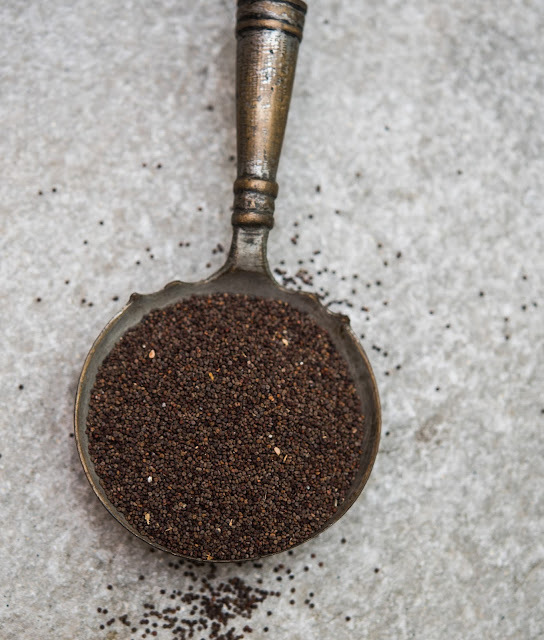 Jakhia is antipyretic and anti-inflammatory and is used for many minor health issues, the spices in Indian kitchen have been known to be curative and healing, their usage has evolved over several generations if not centuries. 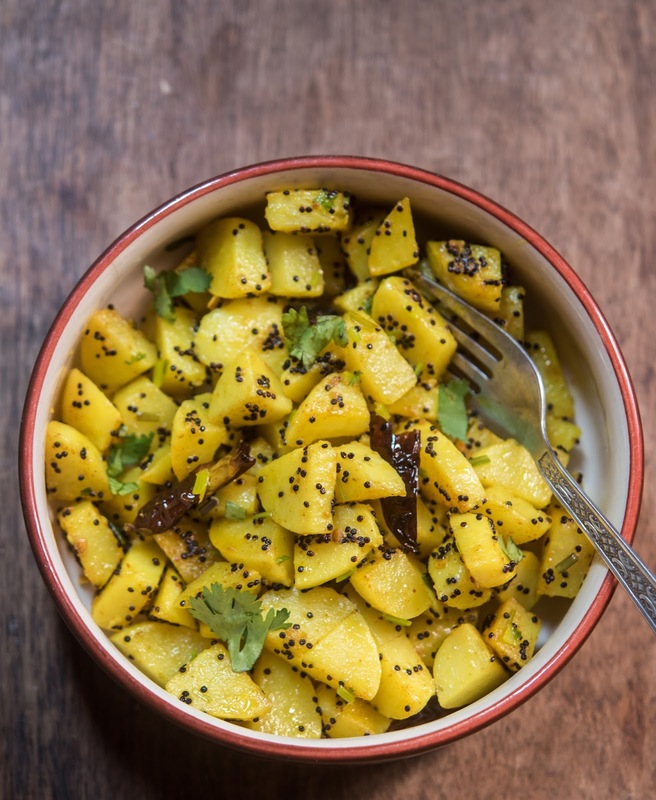 If you don't have jakhia, make jeera alu instead. Alu ke gutke needs good quality potatoes, preferably baby potatoes and jakhia, the other ingredients can vary minimally. Like you can use green chilies instead of red dry ones and dhaniya patta can be a choice, no other changes please. Heat mustard oil, tip in the red chilies and the jakhia and let them crackle for a couple of seconds. Add the turmeric powder and immediately dump the potatoes over it, add salt and mix everything nicely. Keep stirring and cooking for 5 minutes, sprinkle chopped coriander leaves and it is done. It tastes great as a side dish with meals or as breakfast starch if you want some potatoes, it is better than any fries or hash browns trust me. Served with tea it has a unique way of satisfying you. The potato lovers would agree but the simplicity of this alu ke gutke does the wonders if you ask me.